The Law Offices of E. Peter Pfaff is a New York disability claims law firm. 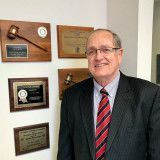 Located in Aurora, Attorney Pfaff represents clients in and around Buffalo who have experienced difficulty getting their insurance carrier to pay their disability insurance claims. Attorney Pfaff also helps insureds with employee benefit and long-term disability, and Social Security disability claims.